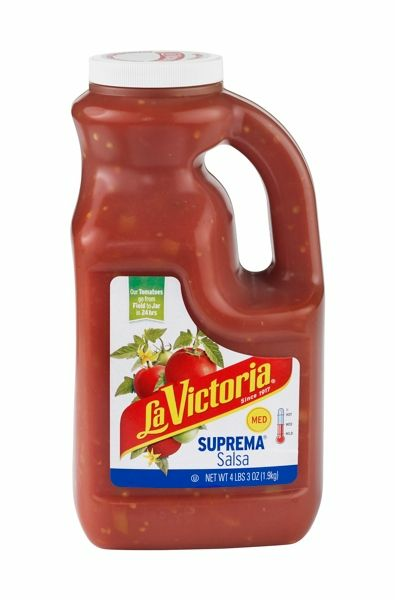 Salsa Suprema La Victoria - Medium - 67 oz. Salsa Suprema La Victoria is an original salsa made with fresh Santa Fe chiles, tomatoes and spices. This superb, all purpose salsa is the same recipe used in homes throughout Mexico. Medium spicy, chunky red sauce with tomatoes, chiles, onions, garlic and cilantro. La Victoria Salsas. La receta original de La Salsa Suprema La Victoria es hecha de chiles frescos Santa Fe, tomates y especias. Esta salsa puede ser utilizada en cualquier platillo y como dip para saborear tus botanas y tostadas favoritas. Salsa roja mediana con jitomates picados, chiles, cebolla, ajo y cilantro. This salsa is unique in the world of bottled varieties in that it does not contain any onion. Only the medium is made this way - the mild contains onion. I have loved this variety of salsa since the early 70s and have yet to find another commercially made salsa that does not contain onion. The list of ingredients is short, and I like it that way. ProsContains no preservatives, no artificial ingredients and uniquely no onion. I feel this variety of La Victoria Salsa tastes more tomato-ey than other brands and varieties of salsa. ConsI unlike other salsas in that it contains no onion, if you want onion. Slightly cooked consistency, but still chunky. Cant live without it. We use it from breakfast to supper and snacking. Great taste but even a better texture. Love it. Just wish like others have said that we could buy it in the stores. What's up with that? We need to all try and get Wal Mart to carry it. I think they did a long time ago. Most people have a Wal Mart somewhat nearby. I have requested items before and gotten them to carry it. Perfectly decent, but nothing to get excited about. It does not list cilantro in the ingredients, nor did I taste any in the product, much to my dismay. I've been ordering the 67 oz size for years because I could never find it when I was stationed somewhere new in the military. This salsa is the perfect balance of everything I like, it's the best! What can I say? We absolutely love this salsa. Why else would one couple order 3 - 67oz. jars? It's the best! I love this product and always have, I was born and raised in California and I live in Pennsylvania now and can't find it, I sure wish I could. I was able to for a short time but the Supermarket quit selling it. How sad.